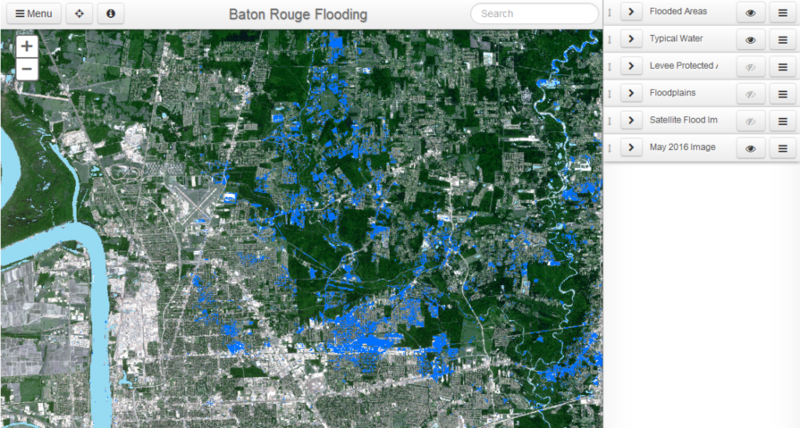 In response to flooding in Baton Rouge, Louisiana as a result of storms in August 2016, we detected flooding using satellite imagery to determine the extent of inundation as it compared to mapped floodplains. The darker blue shows flood inundation on Aug. 14, 2016, compared to locations that typically have water (shown in lighter blue). Mapped flood extent is likely an underestimate due to cloud cover in the satellite imagery. The background image is from May 2016. The map was also featured on NPR’s Morning Edition in September 2016. View a live copy of the map and find more information about our methodology where it was originally posted.